I mentioned last time that I overcame my fear of stranded colourwork with those Spidey Socks. Well, as part of my X-mas knitting, I also overcame my fear extremely fuzzy silk-mohair blends (à la Cracksilk Haze). For my mom, I knit Romi Hill's Ice Queen from Knitty. I didn't use Rowan's Kidsilk Haze, but a slightly cheaper similar yarn called Filatura Di Crosa Baby Kid Extra in a gorgeous silvery grey colour. I love this pattern. It's so simple, just a feather and fan kind of design, but it works so well with this yarn. And fuzzy mohair blends are just made for knitting with sparkly little beads. I used some little shiny purple ones from my bead stash. It ended up stretching out a little more than I'd hoped for, but Mom still likes it, so it's ok. 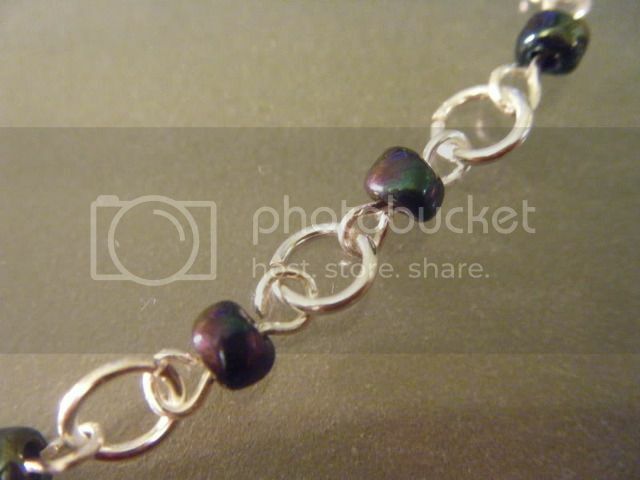 The beads I used for the Ice Queen, I also used for my second attempt at chainmail jewelry. I made Mom a nice necklace to match the earrings I made her last summer. 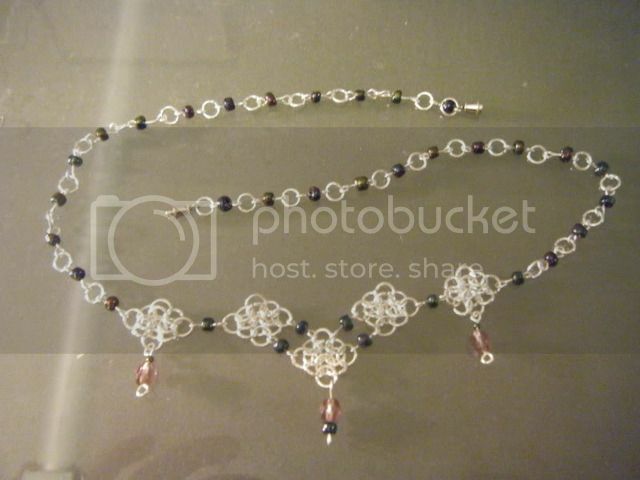 I used the basic rosette from the Chandelier earring pattern in the Anticraft book and then attached them together using these beaded wire thingies. I think the hardest part was making all the loops for the wires, since opening and closing jump rings is pretty easy after a while. Finally, for my Dad, I made an iPod cozy... Yeah, it seems like I copped out a bit on that one. However, I also got him Sean Carroll's awesome new book, From Eternity to Here, which hopefully makes up for the lack of hand-made gifts. I used "The BEST iPhone cozy EVER" pattern by bethanye. It's really simple, but works perfectly. I love the little pocket, to which I added a little button for extra security. I also made it a drawstring pouch. I used the left-over yarn from Stevie's socks. I've actually been doing a LOT of knitting recently, and making a slight dent in my stash, so the lack of posting hasn't been for want of things to write about... I've just been incredibly busy. Hopefully, over the next week or so, I'll be able to catch up on my most recent FOs! I lurve my Newtonmas presents, Ilana! also, everything deserves a knitted cosy! I love the fuzzy white cowl…gorgeous beads!